Ottawa Valley people are fond of poking fun at each other, and there are as many nicknames for Arnprior as there are for folks who live in the upper part of the Valley. But kidding aside, Arnprior really does have the best of both worlds — urban and rural. The town of close to 8,000 people is a hop away from the country’s capital — making it easy and accessible to slip into the city for some night life, a Senators hockey game, theatre, shopping galore, or even a skate or boat ride on the Rideau Canal. For those who enjoy recreation and leisure activities, Arnprior and the surrounding countryside offer a gamut of opportunities. You name it, the place has it! Want to try bungee jumping or whitewater rafting? No problem. Just head to nearby Beachburg for the best whitewater in the entire world (and that’s not just us blowing our own horn!). Want to get in a game of golf or take a run down the slopes? Again, the area offers up scores of golf courses and two ski resorts. If your tastes run to canoeing, kayaking or rowing, the area offers up a host of lakes and two main rivers, the Ottawa and Madawaska. 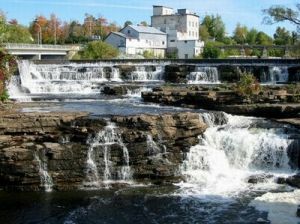 Located at the juncture of these two rivers, Arnprior boasts a number of terrific facilities: a recreation centre with two ice surfaces and a swimming pool; a marina; a first-class 40-bed community hospital that continues to receive one of the highest patient satisfaction scores in the annual provincial report card; and a 60-bed nursing home. Both the hospital and nursing home are operated under one organizational umbrella. Fourteen family physicians provide services to the hospital, and most of these doctors operate their practices in the medical centre, which is physically connected to the hospital. The hospital offers inpatient, emergency and ambulatory care; a wide range of outpatient clinics, radiology and laboratory services, and a physical therapy department. The hospital serves a catchment area of 25,000 people. Bancroft is located in the middle of North Hastings with a population of approximately 4,000. The population of the Bancroft area seasonally adjusts during the summer months to 40,000. Bancroft is a 2.5 hour drive from Toronto, Ottawa and Kingston. The closest large urban centres are Belleville and Peterborough, both of which are a 1.25 hour drive. Bancroft offers two new large grocery stores (No Frills and Price Choppers), a large new Home Hardware and Canadian Tire and a full range of goods and services. Bancroft is the rockhound Mineral Capital of Canada boasting more than 1,600 species of minerals in more than 10,000 identified deposits. Bancroft has been selected by TVOntario's Studio 2 as "The Most Talented Town in Ontario." Bancroft is an area where creativity is a community spirit! Outdoor enthusiasts enjoy a wide variety of activities including nearby access to several Provincial Parks and Conservation Reserves including Algonquin Provincial Park, nature walks, cycling, hiking, canoeing, rafting, swimming at our beautiful beaches, ATVing or snowmobiling on our fabulous trail systems including the Hastings Heritage Trail, geocaching, world class lugeing, taking part in the educational mineral tours, fishing any of our well stocked lakes, sighting numerous types of wildlife in the area, including a growing herd of elk, or spending the summer in a waterfront cottage. Two Family Health Teams in Bancroft are actively recruiting. In addition to experiencing the full range of day-to-day activities of a busy family medicine practice at the Bancroft Family Health Team, medical students spend time in the busy, local Emergency Department gaining valuable skills as they assist in treating a variety of patients. Support staffs include experienced nurses, specialty clinics, a Nurse Practitioner, Social Worker, Dietitian and Psychologist and administrative personnel. North Hastings Family Health Team has just finished renovating a state-of-the-art facility. The clinic has rostered about 900 orphan patients, and has a waiting list of more than 100 families. Locally, no Doctors have been accepting new patients for about 3 years. A Family Physician Recruitment Program is being offered by the County of Hastings. Up to $25,000 per year is available to qualifying medical students (or residents) towards tuition and other expenses. Barry's Bay, Combermere, Wilno ­- each of our three population centres within the Township of Madawaska Valley, is a unique community with recreation facilities, schools, festivities and churches that form the basis of community life. Residents enjoy the comfort of small-town living along with the security of excellent health and education services. With dozens of rivers and lakes, Madawaska Valley is the place to be. Whether you paddle, sail, motor or fish, from Combermere you can explore over 60 kms of navigable waterways on the York and Madawaska Rivers, Kamaniskeg Lake, and Conroy’s Marsh. Our Madawaska River is world-renowned for whitewater canoeing. Those who prefer sun and sand will enjoy the many public beaches. Moreover, our waterways are the best places to encounter wildlife – whether you watch birds, catch fish, or howl at wolves. The many miles of abandoned rail bed offer easy biking and strolling, as well as motorized travel in all seasons. Barry’s Bay Timberfest, held each February, lets loggers and truckers showcase their skills. It celebrates our lumbering heritage and the forestry industry in our area. In Barry’s Bay, the historic wooden water tower is one of only two remaining in Ontario. Our commercial areas are booming, and feature the shopping amenities that residents and visitors alike have come to expect from their community. From fabulous restaurants and taverns, to fully serviced grocery chains and hardware stores, you can get what you need within minutes of your home or cottage. The St. Francis Memorial Hospital in Barry’s Bay provides emergency, palliative and long-term care. With home support services, a nursing home and long-term facility, and a residential retirement facility located right here, family members needing care are not forced to move far away. An active retirement community is based in a busy senior’s centre, while residents of all ages enjoy our first-class community centres and organized sports, museums, a challenging and scenic public golf course, our public library, swim programs and community organizations. 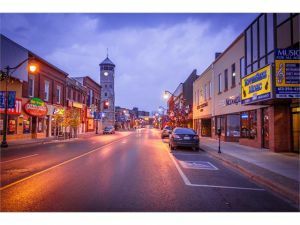 The City of Belleville, also known as the “Friendly City”, is located along the 401 corridor on the beautiful Bay of Quinte. Because of Belleville’s size 46, 000, it offers all of the amenities of larger urban centers with the lifestyle advantages of rural living. There is always something happening in Belleville! Whether you are taking in a Belleville Bulls hockey game, enjoying the exciting sights and sounds of Belleville’s Waterfront Festival, or tasting maple taffy on snow at Winterfest, there are community events happening all year long. The Friendly City offers top quality golfing at a variety of courses for all skill levels. The Bay of Quinte and Moira River attract world-class anglers all year long, for pike, bass, walleye, trout, salmon and perch. Sailing, boating, canoeing and kayaking provide the perfect getaway in the summer. For the nature lover, there are miles of hiking and cycling trails within the city. Quinte Healthcare Belleville General serves over 150, 000 patients with 41, 000 annual ER visits. Belleville offers clinical and diagnostic services including: cardiology, complex continuing care, diabetes education, emergency services, intensive care, laboratory, maternal/child services (including obstetrics, neonatal care, pediatrics, children’s treatment centre), nutrition counseling, oncology service, outpatient services, orthopedics, pharmacy, psychiatry, mental/health services, radiology, rehabilitation, and surgical service. Belleville is constantly recruiting for new physicians in Family Medicine, pediatrics and radiology. Please contact the hospital for updated recruitment information. Brighton is known for excellent fishing, quaint Bed and Breakfasts, antique shops, unique bird watching opportunities, and a truly charming atmosphere. Long known as a summer resort town, the official "Gateway to Presqu'ile Provincial Park" welcomes each season with special events and activities from the Water Fowl Festival in the Spring to AppleFest in the Fall. Surrounded by farms, Brighton's agricultural past is present everywhere. Come visit Proctor House Museum where you can glimpse into the life of a powerful Brighton family whose business interests played an important role in the town for more than a century. Take a step back in time at the Memory Junction Railway Museum. Brockville is almost midway between Toronto and Montreal and less than one hour from the Nation's Capital, Ottawa. There are two international bridges which border the community with access to the U.S. markets via New York State. Brockville is one of the oldest cities in Ontario named after British war hero Sir Isaac Brock. This enchanting city offers a reminder of Canadian history with striking architecture, stately mansions, elaborate fountains--all carefully preserved as reminders of another era. 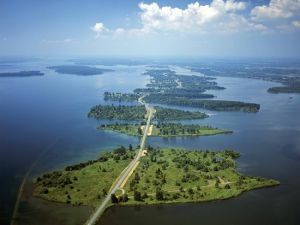 The community is dominated by the St. Lawrence River and is known as The City of the 1000 Islands. Brockville has been awarded one of Canada's safest communities from the World Health Organization. 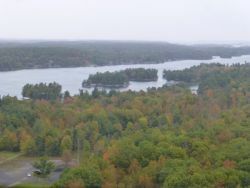 The city is situated in the world famous 1000 Islands tourist area and in fact owns a number of islands off our shore. Brockville offers the world’s best fresh water diving right off our shores with sunken ships at your doorstep. It is also home to world class rowing - a club that has been in operation since the turn of the century! People enjoy high quality of life standards in a unique historic setting. Being one of the oldest communities in Ontario, we take pride in our heritage buildings and how they look. A revitalized downtown area, waterfront open to the public with parks and walking trails, and numerous shopping locations are found throughout the city. Brockville is an active community involved in the arts, theatre and sports. There are several daily VIA Rail connections to Montreal, Toronto and Ottawa and the Ottawa International Airport is approximately 50 minutes. There is a city transportation system available. Brockville has high band/high speed telecommunication capability provided by both Bell Canada and AT&T fibre lines. We are proud what our community can offer to you. Brockville is a great place to call home. We take pride in our community and look out for one another. 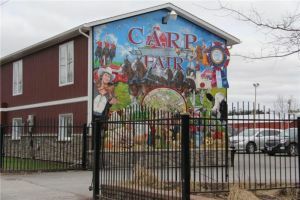 Carp is a large village west of urban Ottawa, Ontario, Canada. It is located in the Carleton-Mississippi Mills electoral riding. Gordon O'Connor is the current representative Member of Parliament. The village takes its name from the Carp River which runs through the village. The main street was formerly a section of the Trans-Canada Highway and carried much of the traffic coming from the west into Ottawa. However the village has been bypassed with the development of the Highway 417. Carp was a rail stop on the Carleton Place, Arnprior, Renfrew, Pembroke line, CARP. With the amalgamation of municipal governments in the region in 2001, Carp is now governed as part of the new city of Ottawa. Carp is used as a mailing address for large areas of the former West Carleton Township. As such, residents of this large area will identify themselves as living in Carp although they may live large distances from the village proper. 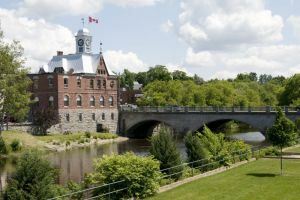 Accommodations in Almonte or Carleton Place. Cornwall is tucked in the southeastern-most corner of Ontario, nestled alongside the majestic St. Lawrence River. 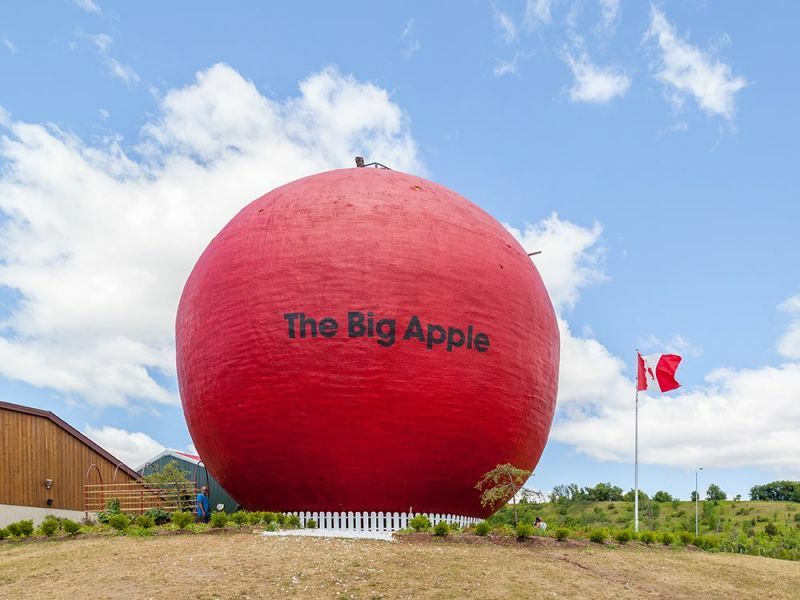 With a population of just under 50,000 the city is a short hour's drive south of Ottawa, the Nation's Capital and one hour west of cosmopolitan Montreal. Cornwall combines the qualities of a smaller community with easy access to major urban centres. Cornwall is known as the 'Friendly Seaway City' with an enviable quality of life along with an equally enviable cost of living. For example, a bungalow that costs roughly $380,000 in Toronto and $300,000 in Ottawa can be purchased for about $150,000 in Cornwall. There is much to do in Cornwall. Each summer, the city presents Lift-Off, a hot air balloon festival, and this year's host of the Canadian Hot Air Balloon Championships in July. With its waterfront location, there are opportunities for boating and fishing and there are also a number of indoor arenas for skating and playing hockey along with ball fields and soccer pitches for participating in summer sports. 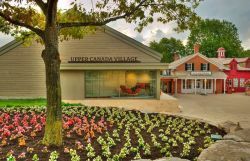 World renowned Upper Canada Village is a short 30 minute drive and winding along the river's shore are 90 km of paved recreational for hiking, biking, rollerblading or a leisurely stroll. The City's health care centre is the Cornwall Community Hospital. It is a full service, acute care hospital combining emergency, diagnostics, in-patient and day surgery, and nuclear medicine. The hospital has close ties to health care centres in Ottawa, Kingston and Montreal with available airborne medivac service. Its current needs include Anesthetists, Family Physicians, Pediatricians, and General Surgeons. House - shared by medical learners. Deep River is located on the Trans Canada Highway (Highway 17) approximately half way between Ottawa and North Bay. 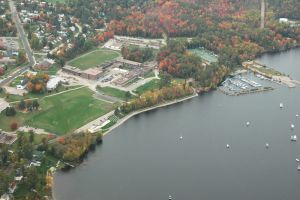 The community is bordered by the beautiful Ottawa River on one side and Algonquin Park on the other. The population of the Town of Deep River is approximately 4,500 and services an area of about 7,500. The area is rich in amenities. In summer there are great beaches, a superb golf course, an active tennis club, excellent hiking trails and wonderful boating. In winter our arena becomes a beehive of activity, our cross-country ski club maintains a provincially recognized trail system and the Mount Martin Ski Club runs our local downhill ski facility. On the cultural front, we have our own Symphony Orchestra, active musical and performing arts groups and a vibrant artistic group that sells their products through Valley Artisans Co-op. Deep River currently has five doctors plus a new family health team that includes two more doctors. The Deep River and District Hospital is a rural hospital serving the Upper Ottawa Valley. The hospital provides 24-hour emergency services, active medical and specialized cardiac care services, as well as, long-term care services. The education levels in our community are among the highest in Canada and our schools are well known for their academic excellence. Deep River is one of the safest and cleanest communities you will ever find, and our great recreational opportunities make it a great place for people of all ages to live. The Hôpital Général de Hawkesbury and District General Hospital is a bilingual, innovative, public community hospital serving a catchment area of approximately 40, 000 people. Located an hour’s drive from Montreal, Ottawa, the legendary resorts of the Laurentians and the American border, Hawkesbury is attractive to individuals seeking a rural lifestyle with ready access to a myriad of recreational and cultural amenities. From rivers to mountains and lakes, we appeal to outdoor enthusiasts. Our location along the Ottawa River provides a water playground for swimming, water skiing, sailing, boating and fishing. Hawkesbury is also very proud of its 2 picturesque and challenging 18-hole golf courses, 4 curling ice-sheets, soaring club and cycling trail. The local terrain provides excellent areas for snowmobiling and cross-country skiing. Some of the finest downhill skiing is available within an hour’s drive. With its gracious neighborhoods, affordable housing, quality educational opportunities and recreational activities, Hawkesbury offers much to experience and enjoy. The quality of life in Hawkesbury is enhanced by the cultural and entertainment opportunities of major art centers in Ottawa and Montreal as well as fantastic shopping just a short drive away. Our modern healthcare center, built in 1984, offers a wide range of services from the emergency room to medicine, surgery, special care, obstetric, chronic care, palliative care and rehabilitation to outpatient clinics. We are in need of doctors in family medicine, anesthesia and surgery. 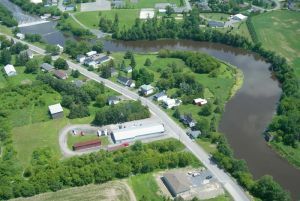 North Grenville is an urban and rural municipality of approximately 15,000 people, located just 20 minutes from the world class amenities of downtown Ottawa, the Ottawa International Airport, Highway 401 and the border with the US at Ogdensburg, New York. North Grenville is home to the Kemptville District Hospital, a fully accredited healthcare facility based on advanced expertise, technologies and patient care practices. We offer 24-hour emergency services. Our use of new medical technology such as telehealth and remote diagnostic imaging has made us a service leader in Eastern Ontario. Our surgical program provides timely access to high demand specialists, while our staff’s dedication to patient care has earned us a reputation for excellence. KDH consistently ranks among the top hospitals in Ontario for patient satisfaction. We serve a catchment area of 70,000 including portions of Ottawa south. Currently, we are actively recruiting new physicians to serve our growing community. 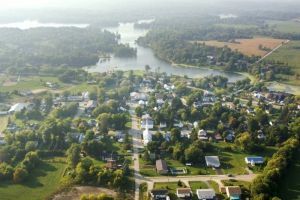 North Grenville has experienced strong economic growth in recent years, which is expected to continue. The municipality still offers a distinct rural flavour with easy access to urban amenities. North Grenville offers great shopping and dining opportunities. Several unique outdoor festivals and events take place each year in this busy, growing community. 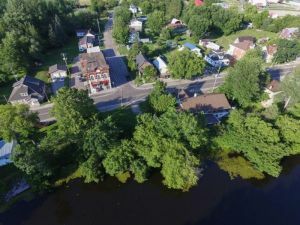 We are 15 minutes from the historic village of Merrickville, “the Jewel of the Rideau,” which holds the title of one of the nation’s prettiest villages. There are over 50 shops and restaurants and many of the original stone houses and buildings still standing from the early 1800s. The 124-mile Rideau Canal System runs through North Grenville and connects Ottawa to Kingston. The village of Lanark is located an hour from both Ottawa and Kingston, north of Highway 7 (Perth). The village itself is quite cozy with a population of merely 4, 800. Lanark County boasts being the maple syrup capital of Ontario. Lanark is home to the eighteen-hole golf course, Timber Run Golf Course. Lanark offers a variety of activities including boating, fishing, skiing and camping. There is a very large environmental movement in Lanark as evidenced in the Art of Being Green Festival. Lanark also shares festivals with Perth, including the Maple Festival and the Stewart Park festival. The North Lanark Community Health Centre offers the community of Lanark, catchment area 11,000, a multidisciplinary medical facility. The North Lanark Community Health Centre is a team of physicians, nurse practitioners, nurses, social worker, dietitian, physiotherapist, chiropodist, health promoter and a vast array of support staff. Both our physicians have privileges at the Perth and Smiths Falls District Hospital and also work in the Emergency department. The United Counties of Leeds and Grenville, on the north shore of the St. Lawrence River, is where the world renowned 1000 Islands region is located. This area is connected to New York State via the Thousand Island International Bridge and the Johnstown/ Ogdensburg International Bridge. In addition, it is well-served by provincial highways connecting it to Toronto (3 ½ hours), Montreal (2 hours), Ottawa (1 hour) and Kingston (45 minutes). 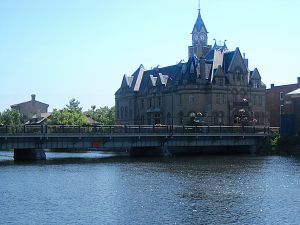 Both the Town of Gananoque and the City of Brockville are the gateways to the Thousand Islands region. The United Counties of Leeds and Grenville offers one of the most diverse areas in all of Eastern Ontario. The County that once counted farming and agriculture as its main industries now enjoys as much benefit from manufacturing and tourism/recreation. Similar to most of Eastern Ontario, the County was settled in the late 1700s by British Loyalists leaving the United States after the American Revolution. Blockhouse Island in Brockville is the best viewpoint to watch the magnificent steel freighters glisten in the sun as they glide through the mighty St. Lawrence River. Weekly sailing races provide further entertainment with their colourful sails flowing in the cool breeze. The many waterfront parks provide a great opportunity to enjoy the river. Sit back, relax and enjoy the 1000 Islands scenery on one of the many cruise boats. Cruises vary in length starting with a one hour cruise that will give you an opportunity to view the many homes and cottages that grace the islands and shores of the St. Lawrence River. Full day excursions that include tours of Boldt Castle and Singer Castle are available with reservations in advance. Fishing charter guides take you to their secret fishing spots in the sheltered waters among the islands. Varieties include smallmouth bass, northern pike, walleye, pan fish and muskie. The St. Lawrence River is also home to the best fresh water scuba diving in the world. Scattered along the bottom of the St. Lawrence River are the historic remains of early navigation through the 1000 Islands. Hundreds of ships met their demise when they struck the shallow shoals. With the clear waters of the St. Lawrence River several of these wrecks are visible from the water's edge. To capture the true experience, dive beneath and view the wrecks gently laying in their pristine condition. Premier wreck sites include: The Keystorm, The Lillie Parsons, and The Robert Gaskin. Leeds and Grenville is a diverse mix of urban and rural communities with varying health care needs. Some communities such as North Grenville and Brockville recruit doctors on a regular basis to deal with retirements and doctors moving to other communities – including family physicians and specialists. Leeds and Grenville is served by the Brockville General Hospital and the Kemptville District Hospital. Residents in the outer lying areas of the region will also access the services of Winchester District Memorial Hospital and the Kingston General Hospital. Live and work in the best region that Eastern Ontario has to offer. Close to nature, but surrounded by major urban centres. Madoc is a community in the municipality of Centre Hastings, Hastings County, Ontario, Canada. It is located at the junction of Highway 7 and Highway 62, southeast of Bancroft, halfway between Toronto and Ottawa. Merrickville–Wolford is a village-status municipality in Eastern Ontario, Canada, located in Leeds and Grenville United Counties. It spans both shores of the Rideau River. The current municipality was incorporated on January 1, 1998, by amalgamating the former village of Merrickville with the former township of Wolford. 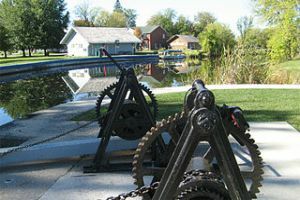 The Rideau Canal locks at Merrickville with three locks have a total lift of twenty five feet. On the south side of the locks there is the old blockhouse, which has been restored by Parks Canada as a tourist site and museum operated by the Merrickville and District Historical Society. In the last two decades, the region has seen a boom in the local economy mostly related to increased tourism. It is famous for its local crafts people and artists. 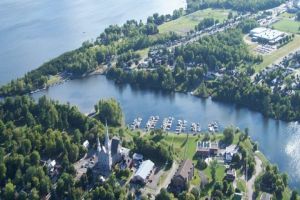 Our medical practices are located in 4 small scenic communities which are all on the north shore of the St. Lawrence River. Our catchment area for our practices spans east to Cornwall, west to Brockville and north to Winchester. According to the 2000 census the population in the South Dundas county area alone was over 10,000 people to be served. Our physicians refer patients to specialists in Brockville, Cornwall, Ottawa, and to specialists that visit both the Winchester Memorial Hospital and the Kemptville District Hospital. Within our eleven physicians group there is both surgical and obstetrical support. The group is affiliated with Winchester Hospital which has just embarked on a $15 million dollar upgrade. The hospital has 56 beds (39 acute and 17 Complex continuing care beds) and is an accredited facility located in North Dundas. The Hospital provides both primary and secondary services to the community with a 24 hour Emergency Department as well as General Surgery, Urology, Ophthalmology and Internal Medicine. We provide anesthesia for bronchoscopy, colonoscopy, and cardio-versions as well as urological, ophthalmic and obstetrical procedures. There are many opportunities within our group. Each one of which can be tailored to suit the individual needs of the new physician. Opportunities include anything from short term locum position to a full partner position. Napanee is a bustling town of 16, 000. Conveniently located along the Highway 401 corridor mid-way between Belleville and Kingston at Exit 579 you'll find a charming community. 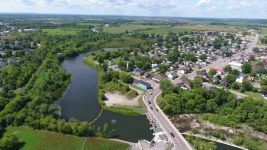 Streets lined with mature maples, a lovely waterfront park and boardwalk, docking facilities a short walk from the downtown and a nice variety of attractive shops and a large establishment of eating facilities will entice you to come to Napanee. Napanee enjoys the luxury of being close to three Provincial Parks. The town hosts a large recreation complex complete with equipment for outdoor sports such as soccer, baseball and fishing. There is excellent cycling in the area and a county trails network. The town provides a great base for day trips to the city for shopping and city amenities. The Lennox and Addington County General Hospital provides primary and secondary care to almost 30,000 residents of Lennox and Addington and portions of Hastings County and North Frontenac. The hospital currently operates 32 beds (24 active care and 8 chronic care). This will increase to 52 beds on the completion of a $ 20 million redevelopment project which is currently taking place. The project includes complex continuing care unit, new operating rooms and a major expansion of the ambulatory clinic areas and the Emergency department. The Hospital’s emphasis on General Medicine and General Surgery reflects its role in providing core services. Specialists from Kingston regularly hold clinics at the hospital. The hospital offers a comprehensive range of diagnostic services supported by a well-equipped laboratory and diagnostic imaging department. There is an Emergency department which operates 24 hours a day and treats 24,000 patients per year. 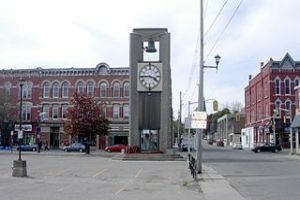 Napanee has been declared an under-serviced community. In response to this, members of the community have recently formed the Doctor Recruitment Committee in an effort to alleviate shortages and attract more doctors for the area. Pembroke is 150 km west of Ottawa situated along the Ottawa River. The town population is 13, 490 while the catchment area for the Pembroke General Hospital is 100,000. Pembroke is a hometown atmosphere with a city centre. 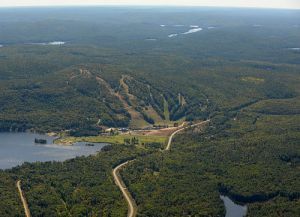 There is a unique selection of recreation & leisure opportunities such as swimming, boating, fishing, golf, hockey, and white water rafting. Over 200 retail outlets. View the historical murals (27) or visit beautiful Riverside Park with full camping amenities, playground, beach and 18-hole golf. Pembroke is an industrious town bustling with agriculture, forestry, light manufacturing, CFB Petawawa and Atomic Energy Canada. Pembroke Regional Hospital is a 203 bed level "C" secondary referral centre with 30 500 ER visits annually, 700 births annually, and 22 000 Outpatient Rehab visits annually. Completion of $46 million expansion project in 2005 includes a new: ER, 10 bed ICU, 19 bed Acute Mental Health, 22 bed Inpatient Rehab, 40 bed Medical unit, Diagnostic imaging dept with CT & nuclear medicine. Other facilities at the hospital include: a teaching hospital for medical students and residents, District Stroke Centre, Ontario Breast Screening Program site, Formal alliance with Cancer Care Ontario, an on-site heliport for air ambulance link to Ottawa and a tele-health link with TOH, CHEO and Ottawa Heart Institute. Specialists: Medicine, Physiatry, Radiology, OB/GYN, General Surgery, Urology, ENT, Opthalmology, Anaesthesia, and Psychiatry. Well-established ambulatory clinics staffed by local and visiting consultants with over 26,500 visits per year. Currently there are 27 FP/GPs. Perth is located approximately 100 km west of Ottawa and 80 km north of Kingston. 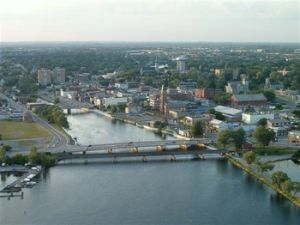 Perth is surrounded by several small towns and villages including Smiths Falls, Carleton Place, Westport and Lanark. Perth is the perfect location for boat enthusiasts as the town is surrounded by several lakes which are only a short distance from the town. The Tay River runs right through the middle of Perth. The Town of Perth has a population of 6,000 with a handful of developments on the outskirts of town. Anyone relocating to the town of Perth has the option of buying or renting, old or new. There are plenty of options when purchasing or renting a home. Perth has many activities that would interest students. We have an indoor pool, an arena and a number of gyms. The town has an amazing outdoor sports facility right in town. It offers basketball, soccer, baseball, tennis, volleyball and an outdoor rink for skating and ice hockey. Being situated on the Tay River, a canoeist has access to the water right at their doorstep! Perth has a fantastic 18 hole golf course situated right in town as well as a number of others within a 5 – 15 minute drive. Hiking and cross country skiing is also readily available. The town of Perth is known for its great restaurants ranging from pub fare to fine dining, two which were named in “Where to Eat in Canada”. The Town of Perth is loaded with artistic flare. Singing, dancing, theatre, artisans and craftspeople reflect what Perth is known for. Perth is a perfect spot for a student to live and work. One can enjoy the peacefulness of the town while only an hour from the excitement of the City of Ottawa. The nearest hospital is located right in town on Drummond Street just a short walk to downtown Perth. Perth also houses a number of medical clinics and is home to over 20 Family Physicians. Petawawa is a town located in eastern portion of Southern Ontario. Situated in the Ottawa Valley, with a population of 15,988 (2011 Census). Petawawa is the most populous municipality in Renfrew County. Prince Edward County is a unique island located in Southeastern Ontario (south of highway 401). The island is surrounded by over 800 km of coastline and attaches to the mainland by bridges and a ferry. This picture perfect community has a population of 25,000 but sees many tourists over the summer months. Prince Edward County has become Ontario’s newest wine region. The weather and soil make it an ideal location for grape growers. In 2000, there was only one winery. Today, there are six, offering both retail centers and manufacturing operations. Water is everywhere in the County! It’s perfect for enjoying shipwreck diving, kayaking, boating and other fun summer water sports. Enjoy the sand and sun at The Sandbanks Provincial Park. The park offers camping facilities and has three different beaches to choose from. It is also considered to be one of the most significant fresh water dune systems in the world. Cycling has become very popular along the many “bike friendly” roads and trails. Quinte Healthcare Prince Edward County Memorial is a 38 bed hospital and houses the Kingston General Hospital, MacSteven Dialysis Unit. Alfred and Plantagenet is a township in eastern Ontario, Canada, in the United Counties of Prescott and Russell at the confluence of the Ottawa River and the South Nation River. The township was formed on January 1, 1997, through the amalgamation of Alfred Township, Alfred Village, North Plantagenet Township, and Plantagenet Village. 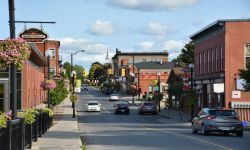 Prescott is strategically situated in Eastern Ontario, linked to the City of Ottawa (a 45-minute drive) via Highway 416, and the urban centres of Toronto and Montreal via Highway 401. A 10-minute drive to the west, Brockville is our closest large neighbour – population 22,000. A direct link to New York State is provided by the Ogdensburg-Prescott International Bridge. The city of Kingston is one hour to the west, and Cornwall is a one-hour drive to the east. 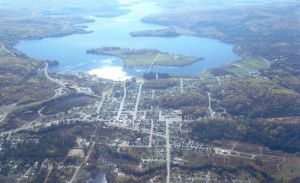 The population of Prescott is approximately 4,200, and serves the South Grenville population of about 18,000. Prescott’s 148-slip Sandra S. Lawn Harbour is a full-service, premier boating facility. 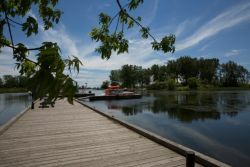 The town also offers a challenging par-70, 18-hole golf course, beautiful waterfront walking trails, public beach, boat launch, outdoor pool, tennis courts and kayaking and canoeing on the St. Lawrence River. The river also offers some of the best fishing and scuba diving anywhere. Bicycle, snowmobile and cross-country ski trails are easily accessible in town and in the surrounding area. Prescott is in desperate need of doctors due to recent and impending retirements. Four family physicians practice from our medical centre, and local health teams are being developed. Hospitals serving Prescott are Brockville General and those in Ottawa and Kingston. There is also a local VON office and lab, and limited clinic access. Prescott is known for its historic charm and friendly atmosphere, and history comes alive here. In addition to the outdoor recreation activities listed above, our many inviting attractions are Fort Wellington and the Battle of the Windmill National Historic Sites, the live St. Lawrence Shakespeare Festival nestled in the harbour amphitheatre, more than 100 stores and services, a historic downtown shopping district, excellent education facilities and commercial and residential architecture dating to the early 1800s. Renfrew Victoria Hospital (RVH) is located in the heart of the Ottawa Valley, in the Town of Renfrew. The catchment population is 22,725, although the catchment population for our regional programs is 100,000. Renfrew is located less than 100 km west of Ottawa, along the Highway 17 corridor. The town enjoys easy access to Montreal, Toronto and Algonquin Park. Whitewater rafting, golfing, skiing, snowmobiling, and boating are some of the inviting seasonal activities. RVH is fully accredited, offering surgical, medical, obstetrical and chronic inpatient services. We are the regional provider of nephrology services, offering hemodialysis programs in three centres as well as pre-dialysis and peritoneal dialysis programs. RVH is a satellite of the Ottawa Regional Cancer Centre providing chemotherapy across Renfrew County. Our emergency/ambulatory department manages over 30,000 E.R. visits per year, as well as visits from 26 specialists. RVH sponsors county-wide services in Alcohol, Drug and Gambling Assessment Referral Service, Sexual Assault/Partner Abuse Care Centre, and Sleep Lab. Our physicians enjoy full diagnostic support including radiological, ultrasound, bone density and mammography services that operate within a PACS environment. Our staff surgeon operates a comprehensive surgical program and our Internist provides exercise stress testing, echocardiography, cardiopulmonary and allergy testing. Construction will begin soon on a $2 million complex to house nine doctors’ offices on the RVH campus. New physicians will have access to a state-of-the art practice setting, with an electronic infrastructure needed to meet the needs of today’s health care world. 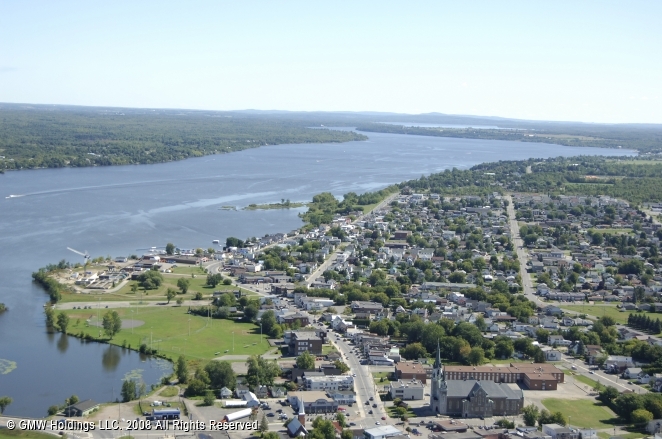 Clarence-Rockland... a quiet, picturesque city nestled on the shores of the historic Ottawa River, an important waterway for early explorers, fur traders and missionaries. 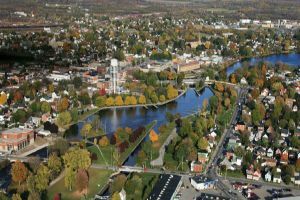 With its humble beginnings as a lumber town almost 140 years ago, Clarence-Rockland has matured into a beautiful city of a little over 20,000 people. Situated just 32 kilometers east of Parliament Hill and about 170 kilometers west of Montreal, the area offers both the quiet of the countryside and the urban offerings of a big city. Along with a healthy distribution of nature's splendor there is also plenty of things to keep urbanites busy. We are a fully bilingual community with a full range of churches, schools and sports facilities which offer endless choices for those who've grown accustomed to essential amenities. We have an amazing golf course, many cultural festivals and work will start soon on the building of our sports and cultural complex, a project in partnership with the YMCA. Clarence-Rockland provides an environment that caters to young and old and offers the serenity of the countryside but the convenience of the city. As is the reality in many rural Ontario areas, the City of Clarence-Rockland is experiencing a shortage of family doctors. The unfortunate families without a family doctor need to go to the closest emergency clinic, located in Orleans, 20 minutes away. There are plans for two new clinics to be built in the City so it would be an amazing opportunity for any doctor that would decide to relocate in our community. The Township of Russell lies approximately 30 minutes south east of Ottawa, just off the 417 highway. The township has 14, 000 residents. Our most popular asset is the NY Central trial, a paved pathway that stretches 7.2 km between the towns of Russell and Embrun which is ideal for roller blades or bikes. Russell Township has two arenas, an outdoor pool and two libraries. There are many community groups (Knights of Columbus, Russell Association for the Performing Arts, Lions, Embrun Recreation Committee, Optimist Club, Horticultural Society, Agricultural Society) as well as many recreational and competitive sports leagues such as hockey, broomball, badminton, soccer, baseball and curling. There are lots of things to do in our little community! Russell is always in need of more doctors! There are two clinics in the Township of Russell, Russell Medical Centre and the Clinique de Médicine familiale d’Embrun. The nearest hospitals are in Ottawa or Winchester, both of which are a half an hour away. Having the amenities of a city close by is a great reason to set up practice here. We offer friendly small town atmosphere with the convenience of being close to a larger city. This is a great place to settle in if you are looking for bilingual communities rich in history, culture and recreation. Sharbot Lake is a village in Central Frontenac Township, Frontenac County, Ontario, Canada, located on the eponymous Sharbot Lake. Being situated in the Land O'Lakes Tourist Region and surrounded by many lakes in the area that are used for outdoor recreation, Sharbot Lake has tourist-oriented shops and accommodations. Also in the village are a public beach and park, a pharmacy, grocery, bank, medical clinic, law office, real estate services, and public library. The nearby Sharbot Lake Provincial Park has hiking trails camp sites, and a boat launch in to Sharbot lake. Sharbot Lake is accessible via Provincial Highways 38 and 7 (the Trans-Canada Highway). It was once an important stop on the Kingston and Pembroke Railway. The rail bed now constitutes a multi-use section of the Trans Canada Trail. Cottage - shared by medical learners. Smiths Falls is a town in Eastern Ontario, Canada, with a population of 8,978 at the 2011 census. It is in the census division for Lanark County, but is considered a separated town and does not participate in county government. 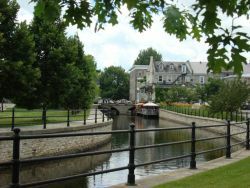 The Rideau Canal waterway passes through the town, with four separate locks in three locations and a combined lift of over 15 metres (50 ft). 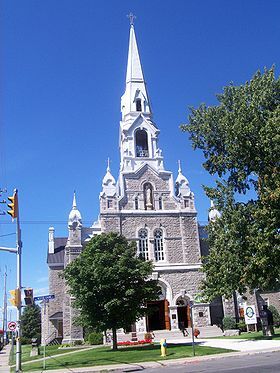 Sydenham, named after Lord Sydenham, is a community in Frontenac County, located in the municipality of South Frontenac. 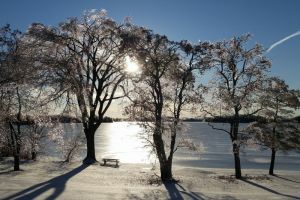 It is situated at the west end of Sydenham Lake and located north of Kingston, Ontario, Canada. The former CPR/Grand Trunk Railway runs through the north end of town, which when the local section was completed, formed the first rail link between Toronto and Ottawa. The abandoned railway right of way is now part of the Trans Canada Trail. Sydenham once held the township offices for Loughborough Township, but after the neighbouring townships amalgamated, it is now the seat for the Township of South Frontenac. Although located in a farming community, many of the area residents work in Kingston. Sydenham has more amenities than many of the smaller surrounding towns making it a hub for the region. Trenton, or Quinte West, as it is now known, is a beautiful community centrally located on the 401 corridor, on the shores of the Bay of Quinte. Just 1.5 hrs. east of Toronto, 2.5 hours west of Ottawa, and 45 minutes to Kingston or 30 minutes to Prince Edward County. Home to Canada’s largest air force base, Trenton is a community that encompasses both urban and rural living. With plenty to see and do amid spectacular natural surroundings there are lots of activities to match your interests. Golfing, fishing, camping, nature trails, snowmobiling, skiing, skating, boating, paddling, sailing and much more - all at your backdoor here! Our area also has over 40 wineries and craft breweries nearby. As well, art galleries, museums, and theatres can be found here. For the foodies, we have everything from gourmet food trucks to gourmet restaurants! Each season offers different community festivals with a focus on cultural, musical, recreational activities and pets!! Our hospital, Trenton Memorial, features 26 beds; a busy ER (approx. 35,000 visits/year); a DI Dept including a brand-new state of the art CT Scanner; ambulatory care clinics; same day surgery suites; medical day clinic; Children’s Treatment Centre and more! Verona, population about 2500, lies about 25 km north of Kingston, midway between the city and the major cottage country corridor served by Highway 7. 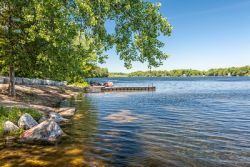 It ‘s at the southern edge of the Canadian Shield, where the friendly mix of farmland, rocky-shored lakes, and mixed woodland make an ideal environment for relaxed living. The village is served by a major grocery chain and several stores and restaurants and churches. Residents are close enough to Kingston to enjoy its cosmopolitan array of shopping and entertainment venues. Its elementary school serves about 300 students from junior kindergarten through grade eight. It boasts a public beach, 18 hole golf course, hockey arena and an abundance of access to the many lakes and streams which surround the village. You can be busy year round hiking, biking, cross country skiing, hunting, boating and fishing. Verona’s medical clinic, one of a five-practice group called the Rural Kingston Primary Care Network, currently serves 2500 patients. Most of its medical staff hold adjunct appointments at Queen’s University, and it is affiliated with all Kingston and regional hospitals. In addition to its regular staff, the clinic has onsite clinics in CPOD, diabetic nutritional counseling, geriatric social work, psychiatry and healthy family relationships. Verona is full of activity. Its community association sponsors the three day Verona Festival and many village booster projects. The Verona Lions’ annual Jamboree has been a 50 year favourite of midway and carnival fun. If you are looking for the friendly and relaxed life of a small town within 40 minutes of the rich research and entertainment resources of a city, you can do no better than Verona. Situated on the shores of Lake Ontario with a view of the largest freshwater dunes in the world at Sandbanks, and in the heart of Prince Edward County’s exciting new wine industry, Wellington is a warm and welcoming working village.